This unique acrylic pen works as a great magnifier as well. Also includes a ruler that will measure up to 3 inches. Put your customized logo on clip. 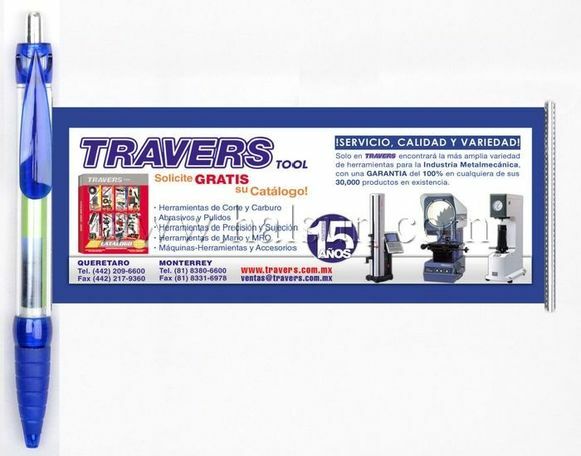 The magnifier pen are great promotional gifts to put in envelope when you sending lump mails. Order your customized magnifier pens today at bayfan.com! Delivery time will 4 weeks to your door by courier like DHL/Fedex/UPS/TNT. If you are in hurry, we also offer 15 urgent delivery service. Pen magnifying ruler are 3 in one promotional pens combine a 3 inch ruler, a acrylic magnifier and a ballpoint pen. 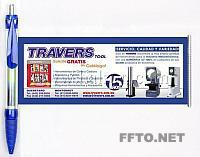 The clip area are flat designed to attached to books, magazines or newspapers, are perfect to imprint custom logo on it. Thus make it perfect promotional gifts. Order your customized pen magnifying rulers today at bayfan.com! Delivery time will 4 weeks to your door by courier like DHL/Fedex/UPS/TNT. If you are in hurry, we also offer 15 urgent delivery service. Periodic table scroll pens look like normal ballpoint pens. But once your pull out the scroll, you can will see a colorful periodic table of elements in full size of 168*68MM. What’s more the scroll is printed both side with offset printing methods. And to ensure the durability, the face side is transparent plastic film laminated. You can pull out to read periodic table of elements, and when done, the scroll will retract back to barrel by itself with a self-retractable spring mechanism inside. 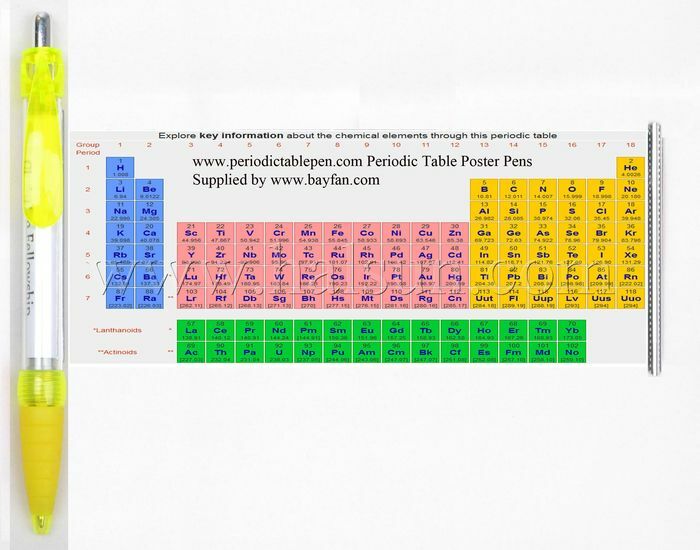 Order your customized periodic table scroll pens today at bayfan.com! Delivery time will 4 weeks to your door by courier like DHL/Fedex/UPS/TNT. If you are in hurry, we also offer 15 urgent delivery service. Perfect giveways for students studying chemestry. Customize your periodic table chart on pull out flag now! Pen barrel have variety of choice, blue, red,green,yellow,purple,orange,white, black, or even opaque white. The flag max size is 168*68mm, which mean your cutomized artwork shall be within that size. 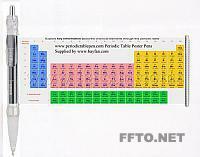 And if you just want standard, we also have a nice look periodic table chart as standard. We can also put your company logo on the flag above the periodic table of elements, thus your company name will show up eveytime students open the periodic table flag pen. Order your customized periodic table flag pens today at bayfan.com! Delivery time will 4 weeks to your door by courier like DHL/Fedex/UPS/TNT. If you are in hurry, we also offer 15 urgent delivery service. Want to get more potential client at young age? Put your company logo on out periodic table poster pens, and give them out to teenage students studying chemistry during one of your school promotion evens. This will definitely deistinguish your company from common nomal company with just a flyer. We have several standard periodic table of chemical elements ready for you. Just send us your company Logo. We will do the rest. Of couse, you can also send us your finished artwork with specific designed artwork. 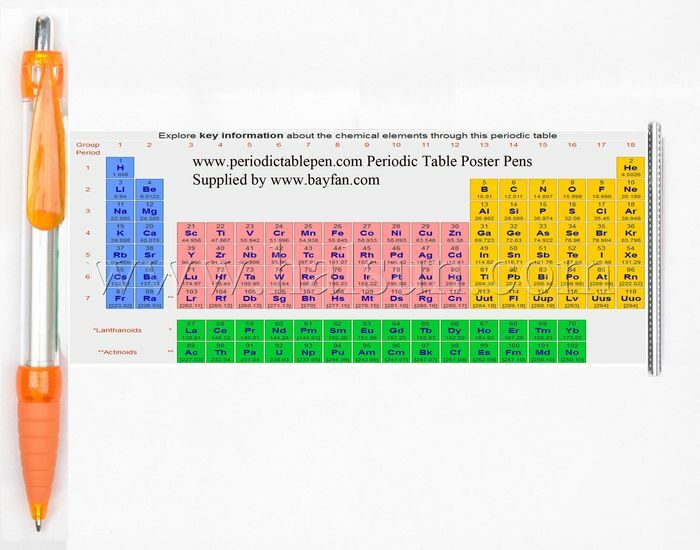 Order your customized periodic table poster pens today at bayfan.com! Delivery time will 4 weeks to your door by courier like DHL/Fedex/UPS/TNT. If you are in hurry, we also offer 15 urgent delivery service. For the students studying chemistry, you won’t find a more convenient storage area for a resource essential to chemistry studies than the Periodic Table Pull out Pen. You can pull out a periodic table of the elements from the spring-rolled transparent pen barrel. The chart also features an alphabetical list of elements, their symbol, and atomic weight on the back. This is ideal as a gift or student prize. 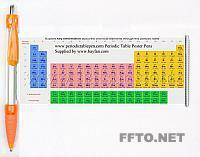 Put you company name on the periodic table pull out pen barrel with one color, or even printed on top of the chemical elements periodic table with full color offset proccess. It’s long last promotion of your company to students as long as they keep the periodic table pull out pens. 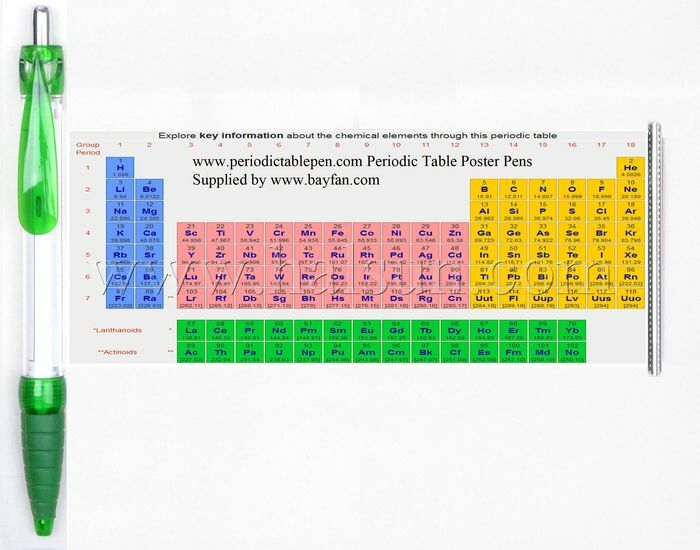 Order your customized periodic table pull out pens today at bayfan.com! Delivery time will 4 weeks to your door by courier like DHL/Fedex/UPS/TNT. If you are in hurry, we also offer 15 urgent delivery service. 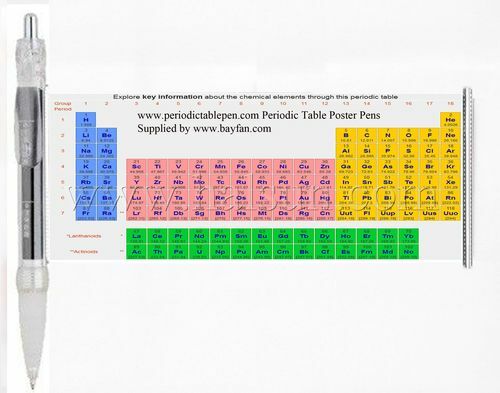 Bayfan’s periodic table flyer pen combines a decent quality smooth handwriting retractable ballpoint pen with rubble cushion at grip and a full color offset printed self-retractable flyer sized up to 180*168mm. With this periodic table flyer pen, your promotional flyer is no long one time usage. 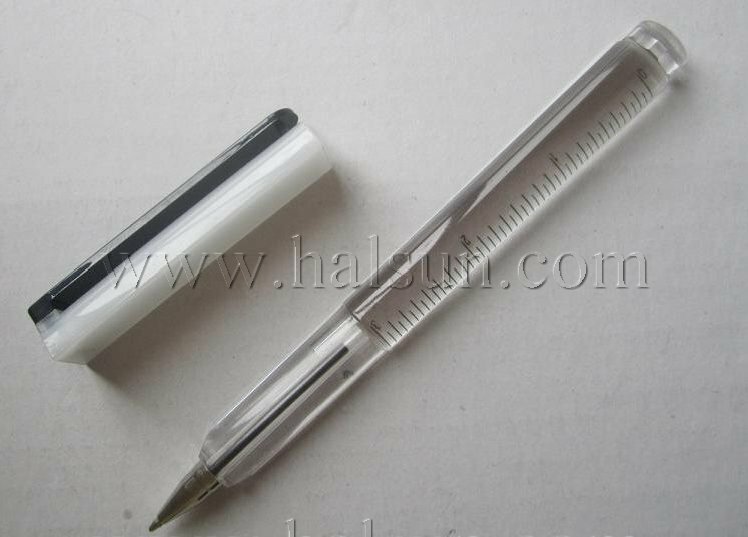 Based on Bayfan’s decent design and high quality, this periodic table pen gonna work for really long time. Once your potential client gets this periodic table flyer pen, it will be with him for quite a long time. This black/blue ink pen hides a roll-out Periodic Table. On the front side is a full color Periodic Table. The back side features a plethora of science facts including common conversion factors, physical constants, gas laws, etc. Featuring a rubberized grip and convenient pocket clip, this is a great everyday pen for yourself and a thoughtful gift for other. 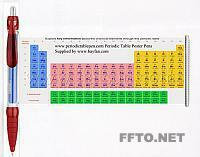 Order your customized periodic table flyer pens today at bayfan.com! Delivery time will 4 weeks to your door by courier like DHL/Fedex/UPS/TNT. If you are in hurry, we also offer 15 urgent delivery service. Keep the periodic table close at hand with the periodic table elements pen. Table pulls out from pen and neatly rolls back into the barrel once your curiosity is satisfied. Both side can be offset printed. Your company logo can be added above the periodic table. Periodic table measures 168 x 68mm. Perfect promotional gifts for products regarding science. Order your customized periodic table elements pens today at bayfan.com! Delivery time will 4 weeks to your door by courier like DHL/Fedex/UPS/TNT. If you are in hurry, we also offer 15 urgent delivery service.